Södra Vallgrund is located at the southernmost part of Replot-Vallgrund. Approximately 350 people live in the village, and there are equally as many men as women. The average age is slightly over 40. From being a former typical fishing and agricultural area, the village has now become a place where many different occupations are represented. Good communications with the centre of the municipality and Vasa city have made it possible for many villagers to work on the mainland and live in this safe cosy environment in the village. In the centre of the village you will find a shop, a school and Sommaröhallen. The Södra Vallgrund Handelslag, which is owned by the people in the village, is a modern grocery store with a large assortment to choose from. D.I.Y. supplies are also sold in the shop. Södra Vallgrund primary school has approximately 30 pupils in six different classes. 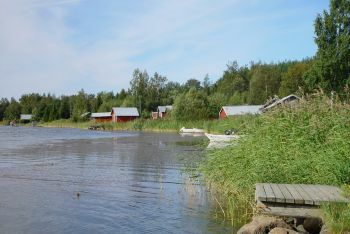 The kindergarten and pre-school are found in the neighbouring village, Norra Vallgrund. Sommaröhallen was inaugurated in 1992, and has now become a great tourist attraction. The Village Association has organised the selling of products made by small entrepreneurs and handcrafters in Sommaröhallen. Thanks to good planning, various kinds of monetary support and thousands of hours of community work, the Sommaröhallen is now a well-functioning cosy place to shop. A fire-proof village archive can even be found in an extension that now provides larger and more useful space. The village archive contains all the important documents from associations, companies as well as private persons for future generations to research. The coastguard and pilot station is nowadays found in the village, providing work and safety for the people in the archipelago. There are many small companies in the village, for example a hairdressers, digging entrepreneurs, transport companies, greenhouses, carpentry companies, producers of herbal ointment and skin care products as well as producers of plastic products. Sommarösund, a 2 km long shallow bay, was still a sound in the 1400s and was used as a sheltered strait by seafarers. Nowadays, the bay is shallow and in many places it is impossible to go there by motor boat. Places that today are more than ten metres above sea level, have earlier been inhabited by people, who have been attracted there by the fish and seal rich waters. A well-functioning basic service system, a nice archipelago environment and an active village association that takes care of the interests of the people in the village, make the people in Södra Vallgrund look towards the future with optimism.